UNDER THE SURFACE makes sure we hear from those who support development of the Marcellus Shale formation, as well as the skeptics. But it is hard not to be moved by the testimony it gathers from ordinary citizens already hurt by the methane explosions, foul groundwater, and other damage … And as a former regulator, it is hard for me to read how little our government agencies have done—or been able to do—to make sure that our health and natural resources aren’t short-changed as this industry continues to grow. -Eric Schaffer, former director of EPA’s Office of Civil Enforcement. I think shale gas is a disaster for the planet's climate. But as this account makes clear it has also taken a profound toll on people and communities with the misfortune to sit atop the Marcellus deposits. Sometimes I think the recipe for a happy life is to make sure there's nothing valuable under your soil. —Bill McKibben, author of Eaarth: Making Life on a Tough New Planet. Capitol Press Room, Albany, New York, May 14. Running from southern West Virginia through eastern Ohio, across central and northeast Pennsylvania, and into New York through the Southern Tier and the Catskills, the Marcellus Shale formation underlies a sparsely populated region that features striking landscapes, critical watersheds, and a struggling economic base. It also contains one of the world's largest supplies of natural gas, a resource that has been dismissed as inaccessible—until recently. Technological developments that combine horizontal drilling with hydraulic fracturing ("fracking") have removed physical and economic barriers to extracting hundreds of trillions of cubic feet of gas from bedrock deep below the Appalachian basin. Beginning in 2006, the first successful Marcellus gas wells by Range Resources, combined with a spike in the value of natural gas, spurred a modern-day gold rush—a “gas rush”—with profound ramifications for environmental policy, energy markets, political dynamics, and the lives of the people living in the Marcellus region. 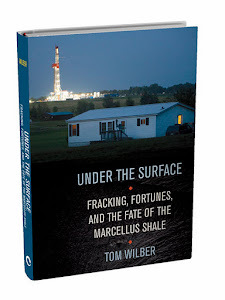 Under the Surface is the first book-length journalistic overview of shale gas development and the controversies surrounding it. Control over drilling rights is at stake in the heart of Marcellus country—northeast Pennsylvania and central New York. The decisions by landowners to work with or against the companies—and the resulting environmental and economic consequences—are scrutinized by neighbors faced with similar decisions, by residents of cities whose water supply originates in the exploration area, and by those living across state lines with differing attitudes and policies concerning extraction industries. The story advances through a narrative told through characters representing stakeholders from various walks of life, including residents, farmers, politicians, lawyers, gas company representatives, and advocacy groups. There is Norma Fiorentino, a plumber’s widow and quarry worker’s mother who signed her land for $25; Victoria Switzer, a retired school teacher who invested her life savings with her newlywed husband to build their dream house in the majestic Endless Mountain landscape; Dewey Decker, a third-generation dairy farmer turned millionaire after he organized a deal with his neighbors to lease 50,000 acres of pristine countryside in Catskill foothills to XTO energy; and Terry Engelder, the world-renowned scholar from Penn State who staked his career on predictions that the Marcellus will become a global energy producer. Wilber’s evenhanded treatment gives a voice to all constituencies, including farmers and landowners tempted by the prospects of wealth but wary of the consequences, policymakers struggling with divisive issues, and activists coordinating campaigns based on their respective visions of economic salvation and environmental ruin. Under the Surface holds a landscape in which the battle over the Marcellus ranges from the very local—yard signs proclaiming landowners’ allegiances for or against shale gas development—to conflicting municipal, state, and federal legislation intended to accelerate, delay, or discourage exploration. For millions of people with a direct stake in shale gas exploration in the Marcellus or any number of other emerging shale resources in the United States and worldwide, or for those concerned about the global energy outlook, Under the Surface offers a worthwhile and engaging look at the issues.